…The awaited continuation of Eve’s wise words on how to best select the perfect ring for your loved one. I am very happy to add a romantic inscription within each ring: something to make one or both of you feel cherished, or perhaps some words that have a special meaning to just the two of you (in any language). I can hand-write your message on the inside of the band, and the inscription length would depend simply on how wide the ring is. There is no charge for this. I like to know that for decades to come, the top of the ring with all of its diamonds will still proudly indicate: “Stay away! This woman is taken!” And maybe in 100 years, the next generation can still enjoy your little piece of history: an heirloom with a story inside! But, in addition to that, I think that there should also be something private: something that only the two of you know. This can be in the form of a small gem, perhaps your birthstone, hidden somewhere on the ring where she will be seeing it every day. Depending on how hard she works or plays physically, we can even have the palm-facing side of the ring carry tiny stones as well (which, by the way, aren’t very costly since they are small!) And certainly, decorative details and designs can always either follow around the ring, or remain just in the front. I have even created rings with a special symbol on the back only: totally private! Regarding quality, I generally like for my diamonds to stay either at or above the VS clarity grade, as well as at or above the G color. While the D Flawless may seem exciting, their very inflated prices reflect their rarity…most of these diamonds end up in vaults rather than worn, anyway. The next grade, VVS (hardly any inclusions), is indeed attractive, but not inexpensive. “Very Slight,” or VS, has a few miniscule inclusions; usually tiny pinpoints of carbon or small veils that still let brilliant light sparkle through. I think that these diamonds have the best cost/value aspect, and will both hold and increase in value as long as you stay within the color grade of G or better (the highest grade being D). Typically, I try to find a diamond with VS/G, sometimes VVS/G, or F/VS grade, or even E color if possible, and not too expensive. Color affects the price a bit more than clarity, since you can see color from across the room. Keep in mind that with clarity grades up to SI/1, any inclusions can only be seen with ten power magnification…beyond that, with SI/2 or I grades, they can be seen with the naked eye. But very important also is how well-cut a diamond is: the difference is immediately seen when the artist who cut the facets has succeeded, as there are certain parameters to achieve, but he still has some leeway in the proportions. That is why a lot of the diamonds sold online are not very exciting: no one has paid attention to the cutting, and they often appear dull. They are not dancing with light, even though they hit all the points of the certification process, and are of the “correct” color and clarity. I work with a pair of cutters, a father and a son, and I can always recognize a diamond cut by the father– it dances! “Interchange 1” ring by Eve Alfillé, featuring a central 1.21 carat diamond (H/S12). Photo credit: Matt Arden. When I know the diamond will be set in prongs, where its girdle will be exposed, I also look at how the diamond’s girdle (where top meets bottom) is cut. It should not be too thin, and I much prefer for the girdle itself to be faceted if at all possible. With other, more secure types of settings, where the edge is covered by gold (like a bezel setting) it of course is not as essential. Also, the diamond market is always fluctuating to some extent: some weeks it is possible to get a diamond in the 1.25 range for the same price per carat as a diamond that is only 1.05 carat…other times, cost per carat will be similar to those in the 1.4-1.5 carat range. It mostly depends on Asia now, as they are increasingly buying larger diamonds, but also on the supply. Most good diamonds now come from Siberia and Canada, with some retrieved from offshore operations (dredging) near the African coast…Keep in mind that a lot of men are looking for magic (round) numbers: exactly one carat, 1 1/4, 1 1/2, etc. So if you can accept, say, a 0.95 carat diamond, or 1.17, or 1.31, there is usually a price advantage. With time and care, we can work together to select your durable gem, and set it safely so that it may be enjoyed by the pair of you for the rest of your shared lives. The continuation of Eve’s wise words on how to best select for your love one the perfect ring. To revisit part one and browse such topics as “precautionary notes on metals, “regarding design,” and “making a comfortable ring,” click here. A collection of sage advice from ring guru Eve Alfillé, a designer who has been creating engagement rings for over 25 years, on how to wisely make one of the most meaningful purchases of your life. Jewelry metals are not hard– in fact they are very soft, 2 ½ to 3 on the Mohs scale, with diamonds at 10 and steel at around 6…but if well constructed and properly cared for, rings can last long enough to give a lifetime of meaning. When it comes to delicate prong settings, platinum is favored as it will stay in place once set. Platinum has no ‘memory,’ so it will stay in place once set (gold tends to want to spring back, and white gold can also be brittle). That being said, even platinum prongs can be pushed aside by impact, sometimes imperceptibly, so it is good to periodically check the prongs. An easy check is to try and insert a thin piece of paper into the space between the metal prong and the stone– if it is able to slide between them, then the prong needs to be tightened. What about sports, or working out with weights? Steel weights are much harder than the gold and platinum in the ring, and could bend the band. 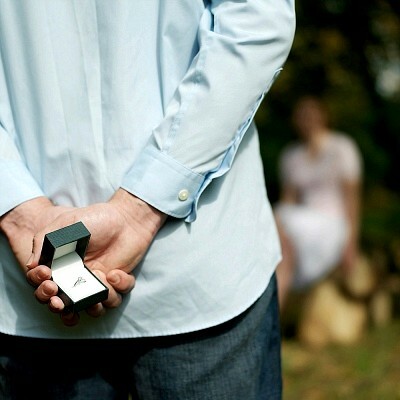 At the same time, most women don’t really want to take off their engagement ring. I would recommend wearing gym gloves, which feel so much better anyway while lifting weights! If swimming regularly in chlorinated pools, please make sure that the gold is 18 karat, and not 14! Fourteen karat has only 58.5% gold vs. 75% for eighteen. If the ring is yellow gold, the common alloys are copper and silver in nearly equal proportions. But the combination of chlorine with the copper in gold, along with perspiration, often causes 14 karat rings to crack over time, whereas eighteen karat gold does not have this problem. “Open Castle in the Woods” by Eve Alfillé. Photo Credit: Matt Arden. Is she a traditional girl who envisions a narrow band, perhaps with tiny diamonds in front, for her engagement ring? Or do you think she is more romantic, with perhaps tiny details of stylized carved leaves gracefully curving around the base of the diamond, like a thirteenth century princess? Is she more of a lover of architectural forms, straighter lines with defined angles? Or a lover of nature, and its gentle curves? As you imagine, a ring can be simple, since the symbolism is in the diamond, but there are many ways to subtly interpret her inclinations, and I love being able to work on these! Are there some forms that have special meaning, like a particular flower, or any other symbols? …These could be incorporated as well. If you look at women’s hands as they wear their engagement rings, you often see that the diamond is not staying centered: its weight tends to make it spin on the finger, sometimes all the way back– not good for the prongs, and annoying for the wearer…But it’s a round ring, and the stone makes it top-heavy, so of course it will spin! Especially for those of us with wider knuckles, you have to measure each ring size at the knuckle…but then the ring is a bit loose at the base, hence the spinning. I have thought a lot about this, and came up with an answer which helps a lot (and which has other advantages) but it runs against custom. Custom tells us that a ring has to be round. But the finger is not round: if you look at the base, it is rather flat in between each finger, and the overall cross-section of a finger is sort of a rounded square. Why not make the ring that shape? You gently twist it on, so that the longer diagonal easily passes over the knuckle, and then the ring will come to rest exactly as it should: without bulging between the fingers as a round ring does, and it will stay in place very well (unless it is very very cold in winter, and your finger has shrunk from the cold!). “A Soft Flame, Burning Steady” by Eve Alfillé. Photo Credit: Matt Arden. Another refinement that I like to add is a gentle swelling called a ‘wave.’ It remains hidden inside of the ring at the back: you don’t really feel it, but it adds strength, helps act as a brake against twisting, and counterbalances the weight of the stone. Best of all, if the ring needs to be made a little larger later on, all we have to do is to pare down the wave– which takes minutes and costs nothing! And, of course, I always want my rings to have very gentle inside edges: nothing too angular where it touches the skin. Eve has been quite busy designing beautiful engagement rings for couples all year long, and we thought you might find the following info-graphic on engagement ring history, interesting and fun. Might I add, that not all of her projects were for young couples. Eve has designed several rings for couples who are seeking more unusual and custom rings, making Eve an obvious go-to choice. Another trend, which continues this year is the use of non-traditional gems for engagement and wedding rings. 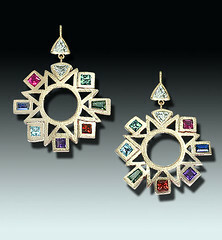 Just like Princess Diana and Duchess Kate’s, sapphires are another popular choice and, not all are of the blue variety. But sapphires are not the only distinction. 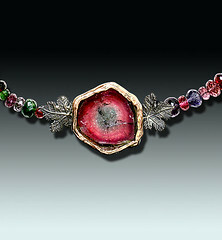 Once you see Eve’s gem room and begin exploring, you will be amazed at all the gemstone alternatives. Just be sure to select a hard gem, that can stand up to daily wear and tear. “Refresh Your Wedding Rings!” says the husband of one woman who is redesigning her wedding ring with Eve this season. After 50+ years of marriage she opted for an updated, sleek and modern Eve Alfillé design which Eve is currently working on. The gallery this year has seen a surprising number of women doing just that! 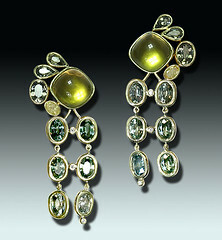 At the gallery, we refer to these projects as transformations and are not limited to wedding jewelry. Eve has undertaken transformations throughout her entire career and every transformation is a fascinating process. The best part happens when the redesigned ring or heirloom piece is complete and clients look upon their new creation for the first time. The look of sheer joy as she sees her redesigned ring in its new form. “I have to caution them to be careful while driving, and not let their newly refreshed rings distract,” Eve says.